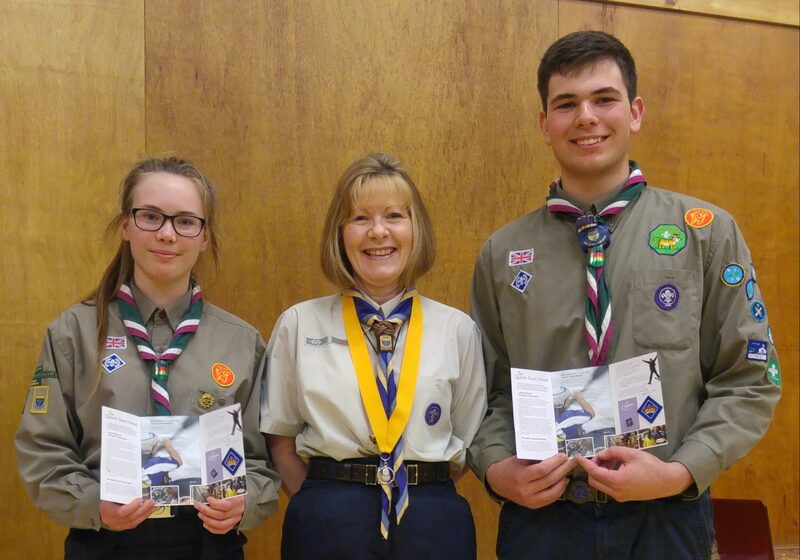 On Thursday 14th April, Irene Orford, County Commissioner for Scouts in West Sussex, awarded two members of Drake Explorer Scouts in Ifield their Queen’s Scouts. 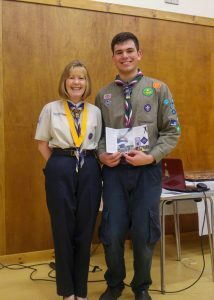 Ania Jasko and Sam Lashwood, both who are 17 years old and have been members of 2nd Ifield (St Margaret’s) Scout Group since the age of six, progressing through Beaver Scouts, Cub Scouts, Scouts and are now Explorer Scouts. The Queen’s Scout Award is the highest award for young people in the scouts and to achieve this they will have already achieved their Duke of Edinburgh Gold Award. Both Explorer Scouts obtained their Duke of Edinburgh Bronze, Silver and Gold Awards. 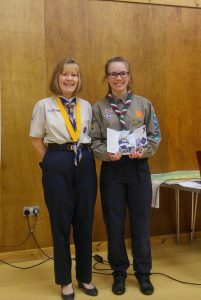 In addition they both had to carry out extra activities, above and beyond their D of E.
To obtain theses awards Sam and Ania carried out a training expedition in the Peak District before their 4 day expedition hiking in the Lake District. They also visited Sweden and Norway and undertaking a three day canoeing expedition in the Swedish Lakes. Back in the UK the two of them organised an act of worship for a 120 young people ranging from 6 – 18 year olds. Ania cycle all the way to Poland for the Charity Mary Meals and Sam has raised money for Sierra Leone. Sam has developed his kayaking skills paddling some of Great Britain’s’ finest whitewater rivers. Ania and Sam were supported throughout their achievements by their leader, Andrew Eastman, who said it gives him a great sense of achievement every time one of his scouts achieves the top award of the Queen’s Scout and his proud of Ania and Sam for progressing to this level and the commitment their have put in to gain this whilst still Explorer Scouts.